Climbers are plants which grow upright, relying on other plants, trellises, structures, and anything else they can find for support. Climbing vines can be an attractive addition to a garden. Climbers can grow in a number of different ways. Some put out tendrils which search for something to lock on to, fixing the plant in place and allowing it to gradually grow higher and higher over time. Others actually coil their stems or leaves around supporting structures. Some use adhesive pads or bunches of roots to grab onto their support structures. 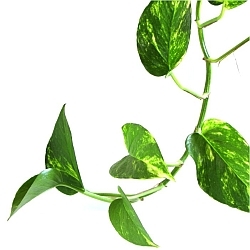 Climbers can also simply grow upright without attaching themselves, in which case they may need to be pinned in place to provide support; this type of climber is often grown on an arbor, in which case the plant will spread out when it reaches the top of the support structure. Lotus tetragonolobus is an annual herb native to the warm temperate regions of the Old World. It i.. Attractively cloaked in deeply lobed leaves, hops produces pine-scented flowers that are widely us.. The deciduous vine, Boston ivy, cloaks the walls of old university buildings across the north.Bost..
bur cucumber, any of several tropical climbing plants in the genus Sicyos, of the gourd family (Cu..